Parents with a love for the outdoors will appreciate our rustic baby nursery themes and pictures of nurseries decorated with homemade cribs and quilts. These rooms would be perfect for a log cabin in a style that deer hunting enthusiasts, fisherman and nature lovers will appreciate. Whether you are decorating for a baby boy or a designing a space with log cabin style baby nursery decor for your baby girl, memories of misty mountain mornings are excellent encouragement for the use primitive decorations and furnishings. Whether you live in your cabin in the woods year round, visit occasionally or are an urban dweller that simply dreams of spending time hunting deer in the forest or fishing in your favorite mountain stream. Regardless of your current circumstances; you are sure to find some rustic nursery ideas in the nursery pictures on this page. 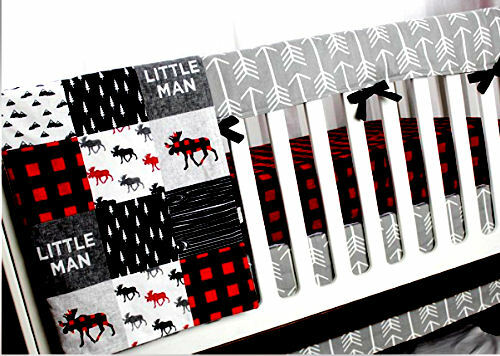 Go here to see this and many other baby crib sets in red and black buffalo plaid with coordinating deer, bear and moose patterns. You will quickly see that a primitive nursery for your new baby is a very warm and cozy place for his or her first years. 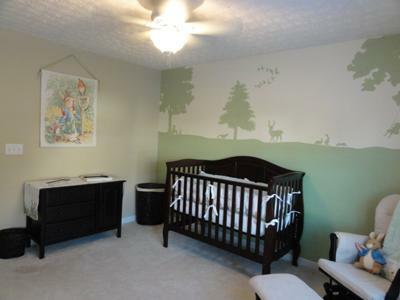 Parents are often divided on the topic of hunting nursery themes. Distressed painter's drop cloths might serve first as a crib canopy for a rustic theme and transition into a play tent later on. 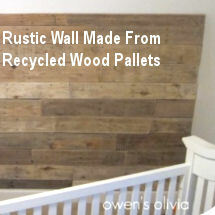 Make your own reclaimed wood nursery wall art. A can of spray paint gives deer antlers a clean, modern look. Horns spray painted white contrasts beautifully with the walls of a log cabin or hunting lodge. Who would have ever dreamed that a trophy buck and a forest wall mural would be the perfect complement for an elegant crystal chandelier? Handmade items tend to give a space more of a rustic, homespun feel. So, the more homemade accessories the better. Visit a flea market or take a vacation to the mountains and visit a craft show if you don't want to make your own nursery decorations or bedding set. A homemade baby crib quilt with Kodiak bears and herds of moose appliqued on the patchwork blocks would be perfect for your rustic baby nursery theme. 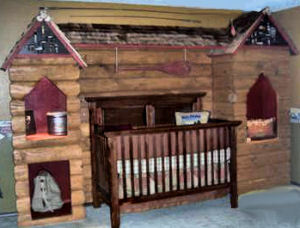 Throw in some wood carvings and baby's room will fit perfectly in a log cabin or hunting lodge in the northwoods. 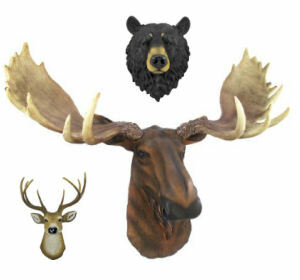 There are (faux) mounted trophy moose, whitetail deer and black bear wall decorations for a baby's log cabin style nursery available for very reasonable prices. Parents who don't actually hunt wild game will appreciate the decorative effect of the stuffed animals that their little ones can enjoy. There are even rustic baby girl nursery ideas that are both modern and suitable for the most isolated hunting cabins that feature homemade log cribs and lodge style furnishings and decor. 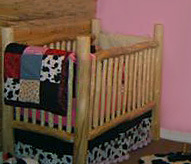 For girls destined to be future farm girls; there are nurseries featuring quilts made from cow-print fabrics and cowhide rugs on the floor. 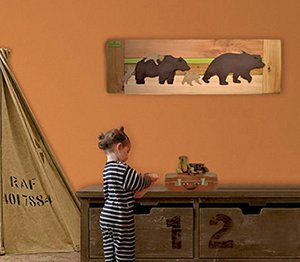 Unfinished boards are to be expected in a cabin style baby nursery theme and the same imperfections that would stick out like a sore thumb in a more sophisticated room are perfect for a room with a hunting and fishing theme. The logs and chinking between are what give country style baby nursery themes such a unique look but if you feel a few wall decorations are in order, you should know that the rules of rustic wall decor are basically that there are no rules! Anything from a pretty tin dish, a quilt or a broom might have been proudly displayed on the walls of the old homestead. You might make a wreath out of pine cones or other natural materials decorated with a ribbon to match the baby's bedding or crib quilt. Choosing the right crib set is just the beginning. Decorating the walls, windows and floor of the space is the next step. You might up your recycling efforts and panel the nursery walls with wood reclaimed from pallets or paint a mural featuring whitetail deer, mallards and other woodland creatures. 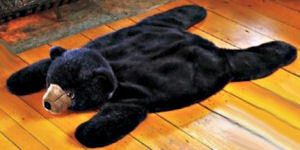 A soft, baby bear area rug will be in keeping with your theme while giving your little one a place to play. These rugs make lovely photo props as well as playing a role in your nursery's decor. Plush bears are also favorites as photo props and rainy day playmates for little ones. Imagine your baby boy or girl posing for a portrait with these black bear baby nursery decorations. The bear holding the moon wall light can easily be replaced by a toddler for a photo shoot. If you are shooting for a truly authentic rustic look that doesn't look as if you bought all of the decorations at the local baby boutique, shop your local consignment or thrift store for vintage items. 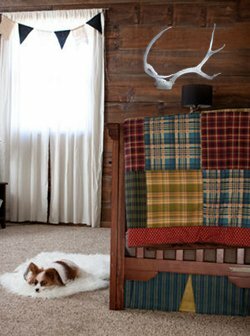 A custom brown bear baby bedding set sewn with plaid fabrics give the space a classic look. To brighten things up, throw some framed kids cartoon moose pictures, baby bear or deer pictures in the mix alongside your quilts and other decorations on the nursery walls. Cabin nursery decor will also give daddy a chance to display his collection of vintage fishing lures or canoe paddles (out of your baby's reach, of course). At the crafts show, look for hand carved wooden switch plates and perhaps a deer antler chandelier to go with your lodge style baby bedding set! For lighting, an excellent baby nursery decorating idea would be to make your own hunting lodge style nursery chandelier from naturally shed antlers that you have collected yourself in the forest. If you're not into do it yourself projects, find one that's ready made. If you have not had the proper training and education, it would be wise not to deal with wiring electrical fixtures. If you have a chandelier in place that you feel you must work with, it's easy to change the shades. 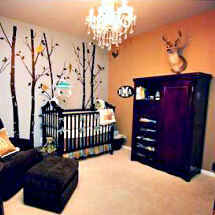 A rustic moose or bear baby nursery theme is one of the very best backgrounds for Christmas decorating as . With your pine cones, greenery and twinkle lights the bedroom is ready for the holidays! Magazines filled with pictures of rustic lodge decor ideas are readily available at any book store. You can recreate the most generic fixture by the installation of rustic themed shades that feature the profiles of moose, grizzly bears, or pine cones for your baby's first room. If you have any extra camouflage hunting items lying about, these can be incorporated into your theme as a layer of added texture. Any outdoors enthusiast will welcome some Realtree or Mossy Oak print draperies, window shades and other functional indoor items in patterns that are traditionally used outdoors! If there is an adjoining bath, there are camouflage shower curtains, rugs and other items that can be used and displayed to compliment the bears and moose in your baby nursery theme. For softness, throw some large plush bears and other stuffed animals in the corners. They'll be comfortable and right at home in the hunting and fishing lodge decor. Please visit again soon to find more rustic hunting theme baby gear and log cabin Unique Baby Gear Ideas.